Zero empathy, condescending, cold, rude, not interested in answering questions. Left me in tears afterwards. Horriblebedside manner, she stood in the doorway with the door open ready to bolt out, and the entire hallway/ other rooms probably heard our discussion. Only wants to treat patients interested in conceiving right away/ already pregnant. Zero empathy, condescending, cold, rude, not interested in answering questions. Left me in tears afterwards. Horrible bedside manner, she stood in the doorway with the door openready to bolt out, and the entire hallway/ other rooms probably heard our discussion. Only wants to treat patients interested in conceiving right away/ already pregnant. Dr Hom was friendly, professional, and knowledgeable. She helped me through my first pap and made me feel about as comfortableas I could possibly be in one of those things. She was patient and kind with me, and I appreciate that she took her time to get to know me and that I didn’t feel rushed. I’d definitely recommend her to a friend! Dr Hom was friendly, professional, and knowledgeable. She helped me through my first pap and made me feel about as comfortable as I could possibly be in one of those things.She was patient and kind with me, and I appreciate that she took her time to get to know me and that I didn’t feel rushed. I’d definitely recommend her to a friend! Dr. Hom has been providing health care to women of all ages since 1980. She grew up in New York City and after her East Coast education, she moved to the Bay Area. Along with Dr. Laurie Green, she co-founded Pacific Womens OB/GYN Medical Group. Over the years, she has had the pleasure of caring for many wonderful patients and their families and is proud of having the privilege of providing care to those that she has delivered. She enjoys outpatient medicine and working in her office and believes and takes pride in telling her staff that she has the world’s best patients. Dr. Hom practices all aspects of gynecology, with a special interest in family planning and contraception, adolescent gynecology, women’s fitness and wellness, and nutrition. She is fluent in Spanish and conversational in Japanese. Her outside interests focus on environmental issues, supporting the performing arts and helping the next generation in their endeavors. When Dr. Hom is not in her office, you can find her in surgery, the dance studio, enjoying nature, or with her family. She is married and has two children. Her Stanford alum daughter is a professional dancer and graphic designer and her son is currently completing his engineering degree at UC Berkeley. Highly professional and personable. Inquisitive yet approachable. Dr. Hom took the time to get to know me and didn’t rush me at all. She was friendly and professional and the appointment was super quick and easy! Dr. Hom, Was lovely, thorough, and welcoming! I couldn't have asked for a better experience. I am so glad I found her! 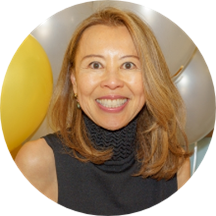 I absolutely adore Dr. Hom – she's friendly, professional, cool/calm/collected and makes sure you're comfortable. The office staff and doctor were mostly friendly and professional. We were seen in a timely manner and it all went as expected. The doctor answered all of our questions. The only thing that made me uncomfortable was the doctor’s reactionwhen we said that we had done our own research and talked to my OBGYN and our primary care physician and decided to not have my daughter get the HPV Vaccine. The doctor seemed irritated and turned cold. From that point onward she talked to my daughter only and pretty much ignored me. That was unpleasant. But we are used to it, so that won’t prevent us from going back for routine check-ups. The appointment was quick with no wait time. Dr. Hom was very nice and easy to chat with - made me feel super comfortable while also being efficient and timely! She was extremely friendly and profesional. I would recommend her to any friend! It was a great experience. She was super professional and friendly. Totally recommended! I recently moved to SF and needed to have my annual wellness check and I found Dr Hom. Typically annual checkups are 100% covered by my insurance so I was surprised to receive a bill. After talking to someone at PacificWomen's OBGYN I found out it was because we talked about things off the "wellness checklist" that then was determined to be an additional visit. Dr Hom was very friendly and easy to talk to. She immediately talked to me about my age (mid 30s) and asked if I had plans to have children. I asked a few questions and that is when I was charged. I didn't initiate the conversation, although not a surprising topic, but I feel that I was almost set up for that. I don't feel that I trust going back to her and while I do think she was a nice doctor I don't want to incur charges unknowingly and I want to feel comfortable having a conversation with my doctor. I also would note that they do not have electronic medical record system. The billing team was very helpful though! Dr Hom is wonderful! She really took the time to get to know me and my medical history. She was super friendly and knowledgeable. The annual exam was very fast and I asked for an IUD consultation where she explain allof the different brands, the pros and cons of each, and how to get one. Can’t recommend enough, she is the nicest OBGYN I’ve seen! FANTASTIC. Felt instantly at ease. Dr Hom is terrific. Dr Hom is, without exaggeration, my favorite doctor ever. She's kind, informative, efficient, and let's you lead the conversation. I'm new to SF and couldn't be happier with finding her on ZocDoc. I highly recommend you book your next appointmentwith her, and will absolutely being booking my next appointment with her. Appointment at 10 really meant I’d be in the room at 10! Office is very well organized even with the large numbers of providers and patients. Dr. Hom is the best! She is very thoughtful, kind and knowledgeable. She seeks to provide the best care possible for her patients and I look forward to seeing her again. Dr. Hom was very personable and took some time at the beginning of my first appointment to thoroughly go through my medical history. The appointment was very efficient and I still left feeling like she listened to all my concerns. I would highly recommend Dr. Hom! Dr. Hom was amazing! I would recommend her to everyone. So professional, personable and kind. I love Joanne Hom, she’s kind, relatable and the absolute best. Dr. Hom was phenomenal. I had some big hesitations about something and she was incredibly caring and informative. She listened, told me her opinion and was the most kind doctor I've ever come across. I felt completely at ease with Dr. Hom and would trust her with anything. Highly recommend. Dr. Hom is amazing, very professional and kind. Thank you so much for being an informative doctor who reviewed all my info personally. You will def be my primary OBGYN. We need more personable physicians like you! Dr. Hom is both personable and professional. She has an extremely warm personality and is incredibly knowledgable. I had an excellent experience with my appointment. This was hands-down the best experience I've ever had at the Gyno. Dr. Hom was so brilliant to talk to. She was very personable, made me feel at ease, and talked to me about my history and made sure to answerall my questions. I had to deal with an immediate problem and Dr. Hom jumped to help me out. She went above and beyond to make sure I got the care I needed and did it all while asking like a caring friend. I can't recommend her enough. The office staff was also very efficient, organized and managed my appointment very well even with a packed office. Dr. Hom is the best! She always makes me feel super comfortable and is a great listener. Appointments are always super quick. She was incredibly sweet and informative. Made me feel so comfortable on my first visit!! Would highly recommend. The front office staff can be a little short and aren’t super friendly, but Dr. Hom is thorough, thoughtful and lovely. Dr. Joanne is very kind and professional. I felt very comfortable during de medical appointment. This was my first visit to Dr. Hom and I was so pleased! The doctor's office was very efficient and I didn't have to wait more than 5 minutes before I was called in to see her. Dr. Hom is verypersonable and it was clear that she cared about me and what I came to see her for. She is very knowledgeable and took the time to answer all of the questions I had. I will definitely be going back to Dr. Hom for any needs in the future! Dr. Hom was so kind and welcoming. She took the time to answer all my questions and give me the education I was looking for. Dr. Hom was kind, responsive, attentive, and incredibly helpful in addressing my questions as a first-time patient. Also extremely on time, and didn't feel rushed. Would wholeheartedly recommend. Dr. Hom was so kind and easy to talk to. She was on time and so helpful and getting me further information that I needed. I would definitely recommend her! i’ve always been beyond nervous as most women are going in for a pap- im not even kidding i didn’t even realize the pap was over THATS HOW EFFORTLESS IT WAS. i live in La and will be traveling to SFfor the sole purpose of Dr. Hom- ???????? thank you dr !!! Dr. Joanne Hom was extremely friendly and informative. Although I scheduled only a birth control consultation, she performed a full annual exam (which was free with my insurance), wrote me two prescriptions, and helped me start the process of getting an IUD. All staff I encountered were very nice and approachable. The clinic seemed very receptive to women of all ages/stages of life, which is refreshing compared to clinics focused solely on pregnancy or family planning. Dr. Hom is one of the bestGyno's I have seen! She was very down to earth and provided recommendations tailored to my lifestyle, as well as suggested alternatives should my insurance not cover some (not many doctors take this into consideration!). I have already recommended her to 3 of my girlfriends and will only book my women's health appointments with her going forward!